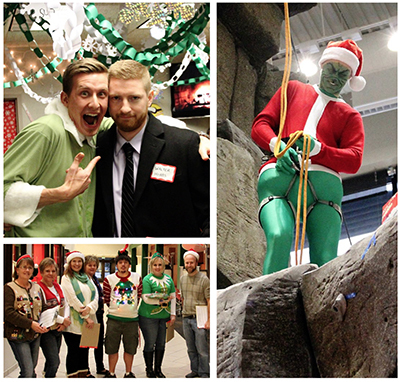 Dec. 11, the judges of the Staff Senate Holiday Decorating Contest named the Office of Enrollment Services as the competition’s grand champion and entry with the best overall appearance and display impact. Recognition was also given to the Wellness Center for creativity, the Veterans Center for originality, and the Office of Financial Aid for theme. The other entries were the Center for Extended Learning, Department of Communication Disorders, Gordon B. Olson Library, Information Technology Central, Mail Room, MSU Bookstore, Office of the Vice President for Academic Affairs, POWER Center, and Registrar’s Office. Minot State University students enrolled in HIST 251: Introduction to Public History will deliver public presentations of their local history research Thursday (Dec. 17) in Old Main 211, 10 a.m.-noon. Each student will present research at an individual computer station, and attendees can come and go as they please. The event is free and open to the public. The nine history majors will offer and comment on electronic presentations of their local history projects. Minot State topics researched are history of the Old Main building, development of women’s athletics, and movement of MSU’s athletic teams to NCAA Division II. Other local history topics include V-12 programs at Valley City State Teachers College and Minot State Teachers College, letters of an American soldier who served in World War I and died in France, history of the Scandinavian Heritage Park in Minot, history of the Minot Eagles’ Club/Eagles Wings Christian Fellowship building and history of the Triangle Y Camp. Bethany Andreasen, professor of history, teaches the course. She introduces students to the field of public history, which involves the public in the process of researching the past, and results in historical presentations that are seen, heard, read and interpreted by a popular audience. Students learn about employment and volunteer opportunities in the field, develop required skills, and undertake individual research projects in local history. Brandon Rudnick, another student, appreciates getting “real life” experience. Some of the students’ research will become part of “Digital Minot: An Online Museum of Local History,” which Andreasen launched in 2012. Through the Digital Minot Project, the public has access to historical photos, postcards, newspaper articles, advertisements, scholarly journals, legal documents, oral histories and biographies related to the history of the region, as well as electronic historical exhibits constructed by student researchers. “History 251 and the Digital Minot Project provide university students with opportunity to engage in professional practice of their historical research and writing skills through an interactive project with individuals from the region in which they live, thus increasing their awareness and understanding of the distinctiveness and development of the region,” Andreasen said. The Digital Minot website can be found at http://digitalminot.minotstateu.edu/dm2015. For questions, contact Andreasen at Bethany.Andreasen@minotstateu.edu. The Student Government Association selected Andy Bertsch, Dan Conn, Robert Crackel, Laurie Geller and Paul Markel as the 2014-15 Professors and Advisor of the Year. Annually, this award honors faculty members from Minot State University’s three colleges and one faculty or staff advisor for their dedication to students. “Student Government Association recognizes the amazing work done by professors and advisors at Minot State and would like to congratulate the 2014-2015 recipients for all the hard work they do both in and outside of the classroom!” said Alex Buchholz, SGA president. Bertsch, professor of business administration, was selected Professor of the Year for the College of Business, and Crackel, associate professor of chemistry, was chosen for the College of Arts and Sciences. Both Conn, assistant professor of teacher education, and Markel, professor of psychology, represent the College of Education and Health Sciences. Geller, professor of mathematics, was selected as Advisor of the Year. For questions, contact Buchholz at sga@minotstateu.edu. Pictured above, left to right, are Laurie Geller, Robert Crackel, Dan Conn and Andy Bertsch. Right, Paul Markel. 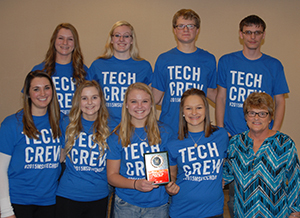 Underwood High School, which received the most points for placements in all competitions, won the Sweepstakes Team Traveling Trophy for the eighth year during the Department of Business Information Technology’s 18th annual Technology Day. Other participating high schools included Berthold, Bowbells, Burke Central, Des Lacs-Burlington, Kenmare, Powers Lake, Sawyer, Stanley, Surrey, TGU Granville, TGU Towner and Westhope. The high school students competed in accounting, business communication, business law, desktop publishing, document production, business principles, spreadsheet applications and webpage design. Every school was eligible to enter one student in each of the seven individual events. Mickenzie Czech, Savana Kingsbury, Aaron Lake and Terry Van Berkom, MSU business education students, and Jan Repnow, business teacher education assistant professor, coordinated and supervised the competition. Winners at the event are: accounting: first place, Eden Johannes, Underwood; second place, Disa Koppelsloen, Burke Central; third place, Jared Halvorson, Stanley; business communication: first place, Lindsey Vangsness, Berthold; second place, Madison Holm, Underwood; third place, Ryan Nesheim, Stanley; business law: first place, Thomas Heidelberger, Underwood; second place, Kaleb Larson, Sawyer; third place, Ashlee Bower, Surrey; desktop publishing: first place, Lindsey Landenberger, Underwood; second place, Brook Blom, Burke Central; third place, Lexi Vandegraft, Bowbells; document production: first, Harley Eckert, Powers Lake; second place, Heidi Knutson, Bowbells; third place, Aleta Gamble, Burke Central; introduction to business: first, Lexi Mahlum, Bowbells; second place, Matt Patten, Stanley; third place, Tanner Net, Des Lacs Burlington; spreadsheet: first place, Sydney Pablian, Berthold; second place, Danielle Halstead, Underwood; third place, Joshua Kihle, Burke Central; presentation software: first place, Taryn Schmit, Bowbells; second place, Delaney Clark, Powers Lake; third place, Robert Cooper, Burke Central; and Sweepstakes team award: Underwood High School with students Dani Halstead, Thomas Heidelberger, Madison Holm, Eden Johannes, Lindsey Landenberger, Devyn Schmitcke, McKenzie Snyder and Brooke Weisenberger. Julie Driessen instructs the Underwood High School team. The Minot State University broadcasting program’s 17th annual auction, held Dec. 3, successfully raised $8,400. This unique fundraising event was organized, produced and promoted entirely by MSU students with guidance from Janna McKechnie, KMSU Auction coordinator. The KMSU Auction promotes local businesses through various media in exchange for donations which are collected by students. The donations are then organized into packages which are auctioned off on live television in a QVC-style format. Viewers call in to place bids on-air during an allotted time with the highest bid winning the package. The students donate 10 percent of funds raised to a charitable cause. This year, the charitable benefactors were Project Ignite Light and Minot Backpack Buddies, both programs supporting local children in need. For questions, contact McKechnie at janna.mcjechnie@minotstateu.edu. The holidays are here, and that means it’s time to register for the spring 2016 semester at Minot State University. Current students are urged to enroll in classes on campus and at Minot Air Force Base, or for MSU classes and degree programs in Bismarck and Fargo. Online classes and degree programs are available as well, and students are encouraged to review the schedule to evaluate all of the flexible course offerings. Current students may register at any time by visiting Campus Connection, located at http://www.minotstateu.edu/cc/. Evening classes begin Jan. 11 and daytime classes begin Jan. 12. For more information, visit www.Askmsu.com or call 858-3350 or 1-800-777-0750. Minot State University welcomes new employee, Roxi Mathis, who is a catalog assistant in the Gordon B. Olson Library. She holds a bachelor’s degree in graphic design from MSU, and she is an active artist in the local community. Dec. 16-30 — “The Space Between History and Hollywood,” mezzotints by artist Linda Whitney of Valley City, Hartnett Gallery. Dec. 16-Jan. 15 — Recent acquisitions to the MSU permanent collection will be displayed, Library Gallery. Jan 12-Feb. 19 — “Americas 2016: Paperworks,” a national juried exhibition with guest juror Karen Kunc of Lincoln, Neb., Hartnett Gallery.